The Escapism Founder, known for his renlentless pursuit to forever destroy the stereotype of the struggling artist, had 25 fans from around the USA join him to witness this solemn occasion. It was a dream come true for the patriotic philanthropist. 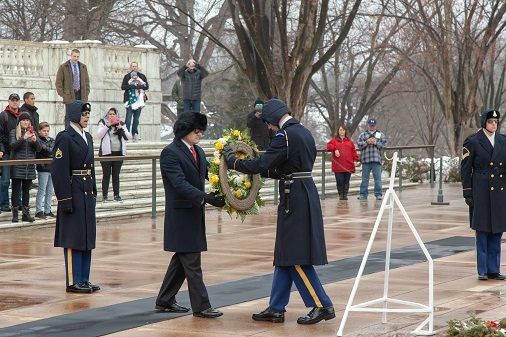 HOUSTON - Feb. 5, 2019 - PRLog -- On Friday, January 18, 2019 at 11:15 a.m. EST, Houston Artist John Ross Palmer had the high honor of laying a wreath at the Tomb of the Unknown Soldier at Arlington National Cemetery. The philanthropic Eagle Scout joined the likes of Queen Elizabeth II, German Chancellor Angela Merkel, Russia's Vladimir Putin, British Prime Minister Theresa May and countless United States Presidents in performing the solemn act. The 45-year-old Palmer, who celebrated his twentieth anniversary as a professional artist in 2018 with a Retrospective spanning five days, had twenty-five (25) supporters from around the United States join him to witness the magnificent occasion. Palmer's wreath laying was sponsored by The First Class Club ("FCC"), the elite group of Palmer art collectors that sponsors his annual international trip and art series. Inaugural club members Judy Lindsay of Huntersville, NC and Julio Montano of Houston, TX were in attendance, and, following the ceremony, it was Lindsay that had the pleasure of announcing Palmer's 2019 destination: Vietnam. Judy Lindsay opened the announcement envelope at the celebratory luncheon hosted by Palmer for all of his supporters in the Cabinet Room of the Old Ebbitt Grill. To date, the FCC has sent Palmer to create art series in Berlin (2010), Dublin (2011), Jerusalem (2012), Sao Paulo (2013), Nice (2014), Port of Spain (2015), Havana (2016), Auckland (2017) and Bogota (2018). "I have huge respect for our country's service members and words cannot express my appreciation for those making the ultimate sacrifice to preserve our freedoms," says Palmer. "My career is built upon the freedom of speech that is guaranteed by our Constitution. As I lay the wreath, I was exuding gratitude for the protections that our soldiers have given to me and millions of Americans." Palmer and his team took painstaking detail to ensure that the ceremony was sufficiently dignified. Renowned floral designer Kevin Aubrey created Palmer's wreath that masterfully interwove both white roses and an abundance of yellow roses for the fifth generation Texan. The artist donned black leather gloves from Argentina, a custom suit with masterfully fitting black top coat and a black rabbit fur Russian Ushanka hat. Internationally acclaimed artist Elena Sandovici was present to capture the ceremony with her original sketches and watercolors. Documentarians Mike Williams and Evan Hambrick were present to preserve the occasion in photos and film. If you have questions about John Ross Palmer or his Wreath Laying Ceremony, please contact Palmer's husband and Gallery Owner Ryan Lindsay at 713-861-6726 or Ryan@JohnPalmerArt.com. You can learn all about this patriotic philanthropist by visiting http://www.JohnPalmerArt.com.